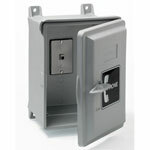 The PT-9700 Weatherproof Enclosure comes with a modular 630 telephone wall jack and hinged door that provides for a weatherproof seal to protect telecommunications equipment in harsh environments. Wall or pole mount (hardware not included). Great for outdoor use.